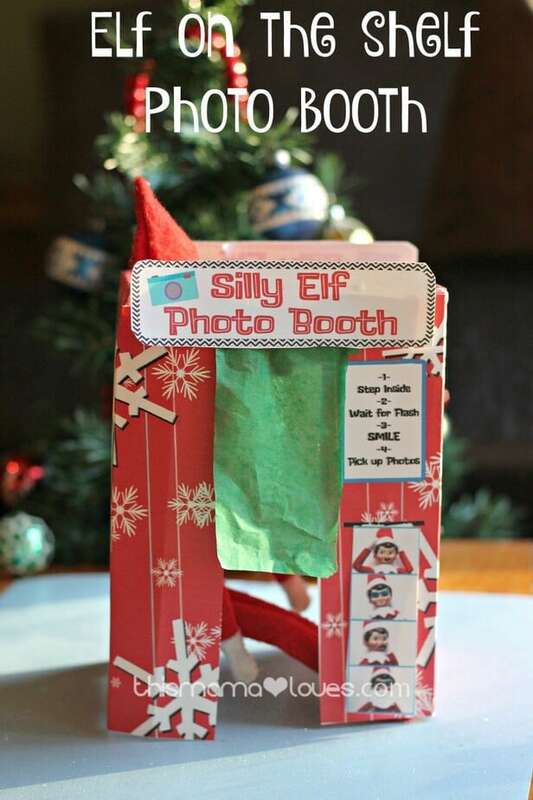 Elf on the Shelf Photo Booth- Printable Elf fun! Some of us are We’re always taking photos of our elves, or they are doing silly things to our photos… why not let your Elf on the Shelf have a little fun of their own? 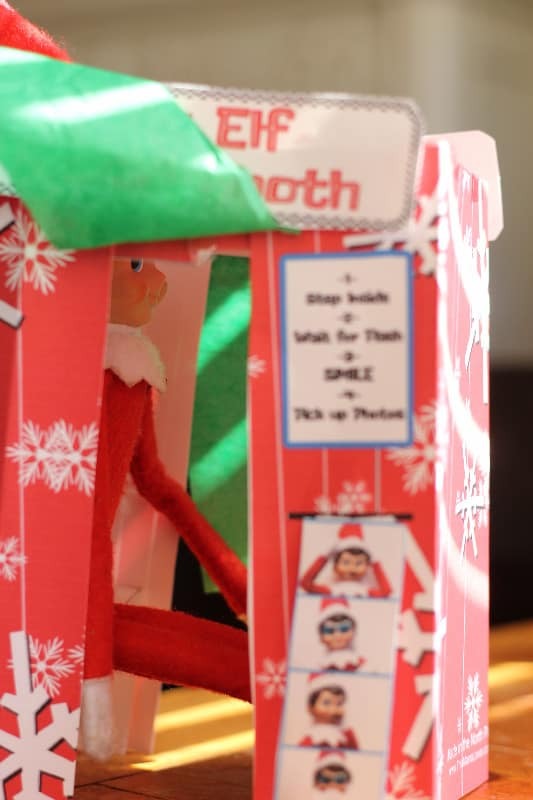 I had my friend Elizabeth make this ADORABLE printable Elf on the Shelf photo booth that you can print and set up – it’s sure to get giggles from the kids! If you’re wanting to do some other fun printables for your Scout Elf, check out our Massage Table and Dunk Tank for your holiday pals. Lots of folks have told me they love these printables because they can print them at work, assemble at home and not have to think up a new idea that day!! **Before you get started, you’ll want to grab some card stock, tape, scissors and a few pieces of tissue. 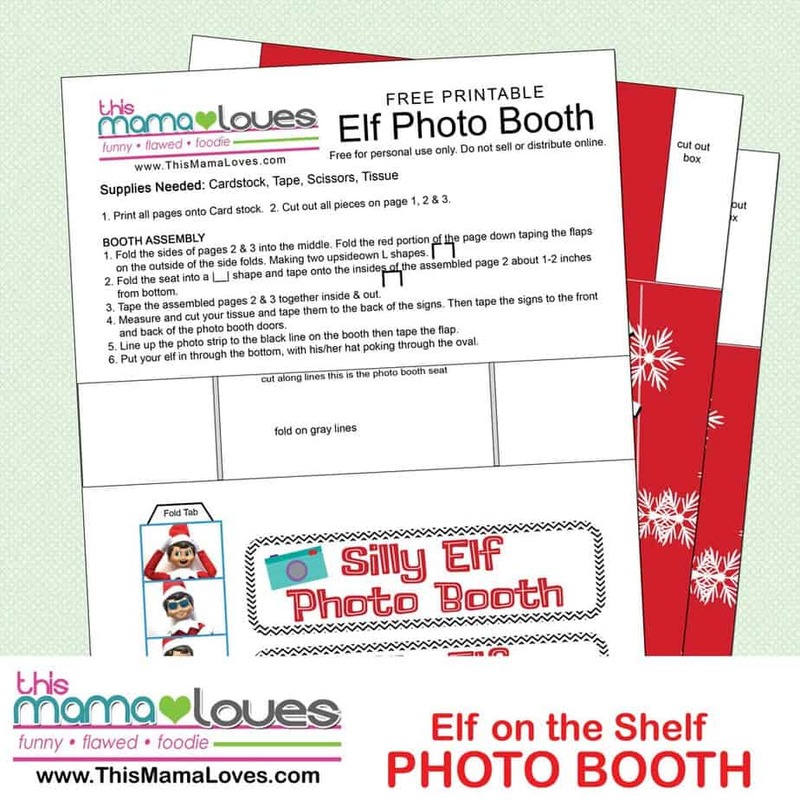 Download the free printable Elf on the Shelf photo booth here or click the image below. 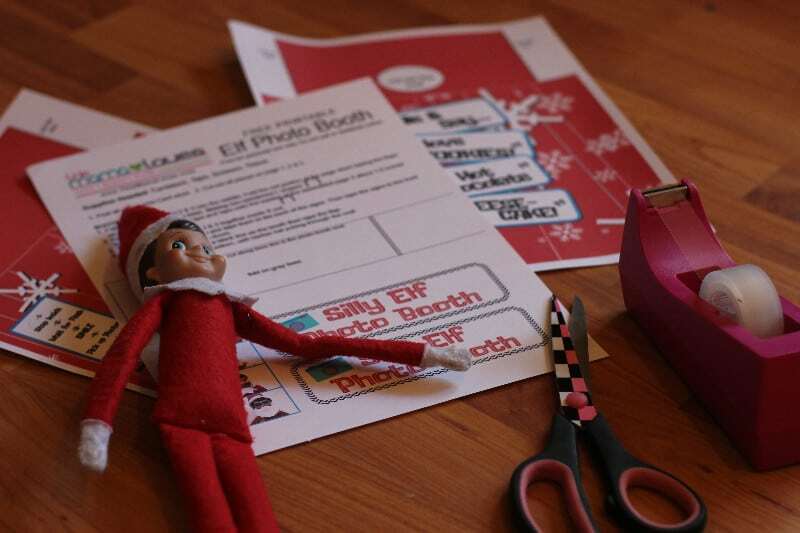 Per your printer instructions, print the photo booth on your cardstock and get ready for some elf antics! Cut out all your photo booth parts along the marked lines. Fold sides of booth inward, giving them a sharp crease. Fold ends of bench down and tape a couple inches up from bottom on the side with a hole in the top for his hat. Tape sides securely then tape them together, you will have a small gap in the center- here is where your tissue paper curtains will hang. 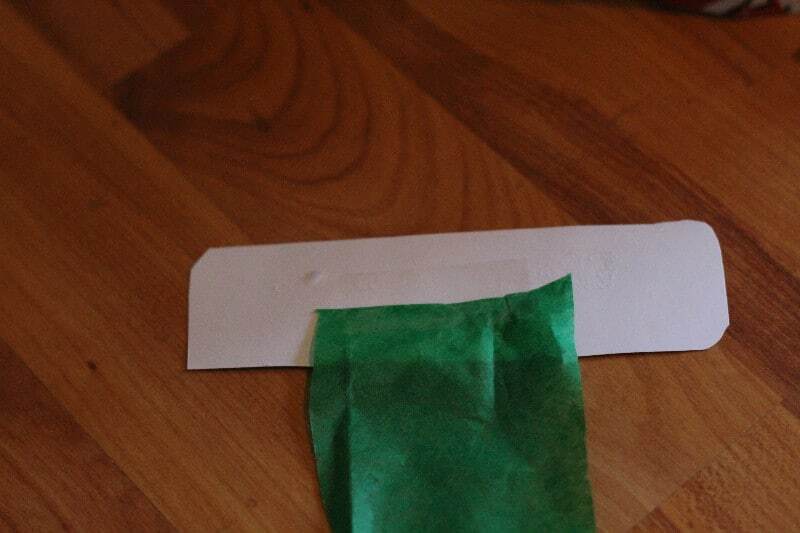 Cut tissue paper to fit opening, tape down onto Silly Elf Photo Booth Sign. Then affix sign over each opening with tape. 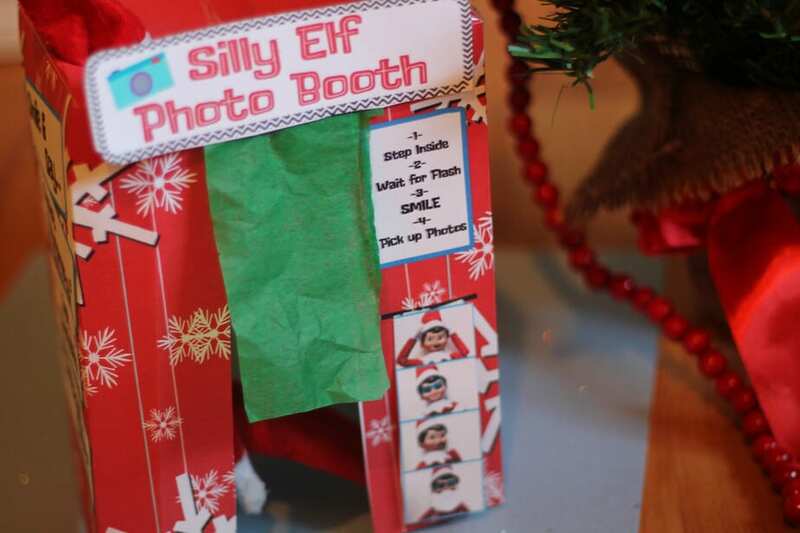 How fun is this silly little elf, and the cute photo strip he made? What are your favorite Elf on the Shelf antics? 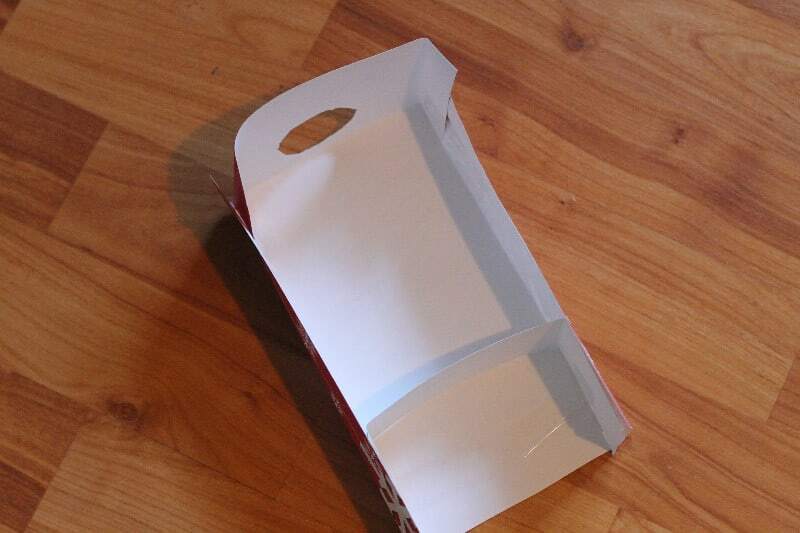 Do you do Elf on the Shelf photos? I’d love to see yours! Thank you! I just assembled the photo booth and am waiting for my daughter to go to bed and set it up. She will love it in the morning. I used an empty display box from coloring books from the dollar tree it worked great! Thanks for sharing the idea. 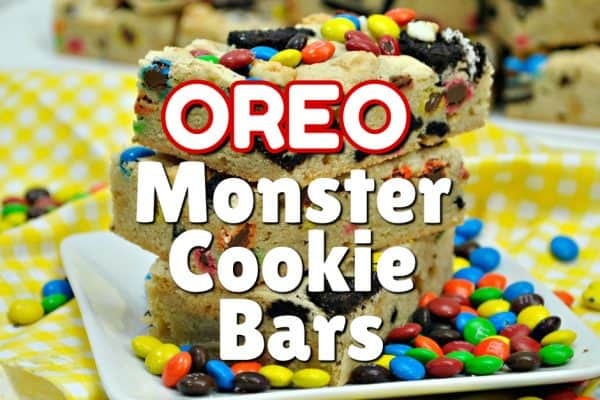 I could just add the labels to the outside! Can’t wait to use it with my classroom elf! 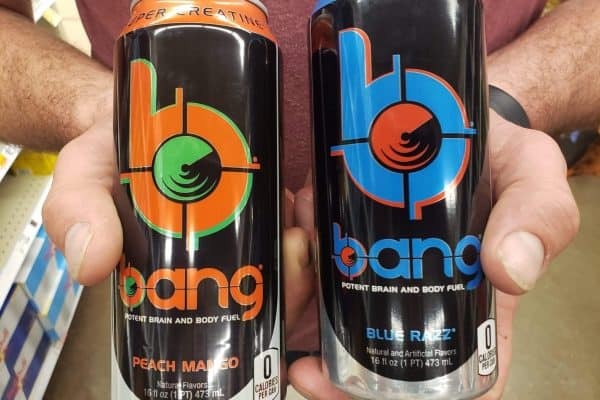 OMG thank you so much these are going to be a great hit this year and thank for them being free!! I am saving this for next year! Thank you so much for sharing! Hope you had a great Christmas! 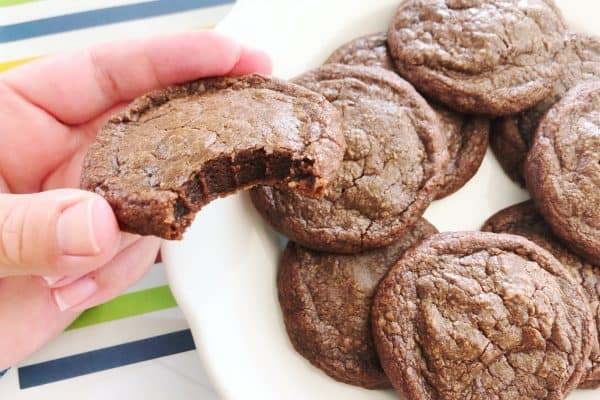 Oh My Gosh – these are ADORBS. I love them the ALL …. My favorite is the Photo Booth – May I share your links on my pages ? ?